You begin from Helsinki, where you collect your bikes and take the train to Turku (train ticket included) to start your tour. From here, you can choose a 5-day/4-night itinerary focusing on the Turku Archipelago area, or a longer 9-day/8-night route taking you further out into the Baltic to include the islands of Åland. Accommodation along the way is in local bed and breakfasts. Breakfast is included and lunch and dinner is purchased separately at a wide choice of restaurants and cafes along the route. The tour is self-guided and you will carry all luggage with you, but detailed route and tour information is provided on pre-loaded GPS, making it easy to discover this very special archipelago area independently. High-quality electric bikes allow you to carry luggage easily in the panniers provided. Photo: HEB. The Turku Archipelago lies in the west of Finland, with the Åland Archipelago further west in the Baltic sea. These island areas offer charming villages and harbours, beautiful natural landscape and a rich history and a perfect to discover by e-bike. The island network is connected with a combination of ferries and bridges, making island hopping a fun and straightforward experience. While still very much an active holiday (you still need to pedal to move your e-bike forward! ), e-bikes take a great deal of the effort out of cycling, assisting you greatly, especially on uphill sections, and allowing you cover greater distances while leaving you fresh to enjoy adventures along the way! E-biking in the Turku and Åland Archipelago is very suitable for couples or groups of friends as well as active families with older children (min. age 12). With flexible start dates throughout the summer/autumn season, it offers the freedom of a self-guided tour but with a detailed route itinerary and all accommodation provided. The tours take you through beautiful archipelago landscapes with information on points of interest provided. Photo: HEB. E-biking in the Turku and Åland Archipelago is a self-guided experience. You will be provided with a tool and puncture repair kit and to participate in the tour, you should be comfortable fixing a puncture independently (though punctures are very rare on the tours) or dealing with other minor issues such as basic bike adjustment. As your tour takes place far from the e-bike centre, in the event that a support vehicle needs to come to you personally, a local charge will apply. However, it is very unusual that such assistance is required and of course in the event that the issue is found to be caused by a mechanical defect of equipment (such as seized bearings or a cracked bike frame) no charge will be made. Depending on your location at the time, it will normally take several hours between notifying the e-bike centre that you require assistance and a member of the team reaching you, or in some cases a local contractor may be used to offer assistance or you may be advised to take a taxi to a local repair centre. In some cases you may be biking on tracks where vehicle access is not available, in which case you will be asked to push your bike to the nearest suitable meeting point. Charges are as follows and depend on the distance that needs to be travelled from the e-bike centre: 0-50km: no charge; 50-100km: 100 Euros, 100-300km: 150 Euros. If required (for example if it is late in the evening), you will then be driven to your next accommodation. NB: For this experience it is necessary to overnight in Helsinki before and also normally after your tour. Please arrive at the e-bike centre at 09.00, where your bikes are prepared for you and you transfer your luggage into the provided bike bags/panniers before setting off. Once ready, you cycle 2km south to Pasila to take the train to Turku central railway station. Today you have a lovely route exploring Turku, including parks, nice spots for lunch and other interesting sights to see in the area. Check in to your hotel in the afternoon and wander down to the River Aura, where there is a wide range of places to eat and drink. After breakfast, cycle to the river and start your first boat ride into the Baltic Sea. Relax and watch the beautiful island views pass by and you reach Nauvo harbour after a couple of hours - a bustling place that's interesting to explore on foot. Carry on west and stop at a farm specialising in gourmet berry products, then take the ferry to Korppoo island (where you will finish and there are a number of restaurants around the town centre and Verkan Harbour). Overnight will normally be Korppoo but may on rare occasions be in Nauvo depending on accommodation availability. This morning you take the 30-minute ferry to Houtskär island from Galtby harbour. Näsby is the main village of the small group of islands of Houtskär and you can visit an old wooden church built in 1703 or go to the local museum, plus there's a restaurant and a beach to while away a sunny morning. After lunch, jump on the ferry for an hour to the Iniö islands. These are more remote compared to the earlier islands with only 10 of the islands being inhabited with a population of 200 people living here year round. Enjoy the quiet nature of Iniö, cycling the gravel tracks and seeing glimpses of the former fishing villages. Continue your journey by taking the ferry to Kustavi, where you can see artisans at work in the handicrafts village and stop at the Taivassalo Museum with its story of the local ties to the sea. As you wait for the ferry at Hakkenpää harbour, enjoy a drink at the Sahan Saluuna bar. Depending on where your accommodation for the night is located, from Teersalo you will either take the ferry to Velkua island or continue your cycle tour towards Turku and the mainland. Today you bike on the islands of Merimasku and Luonnonmaa, which are larger. Stop for lunch at Restaurant Rantamkasiini, then bike over the bridge to Naantali, a popular summer holiday location for Finns with good restaurants and cafes. Your tour comes to an end as you bike back to Turku for train to the e-bike centre in Helsinki. End time is flexible. Please let the e-bike centre know your expected return time and be back at the centre by no later than 20.00. Please arrive at the e-bike centre by 09.30 so the bikes can be prepared. When ready and packed, you bike to the train station at Pasila (approx. 2km from the e-bike centre) and take the train to Turku central station (1.5 hours). After lunch her, bike to Naantali, a popular summer town, and from here you bike over your first bridge to the island of Luonnomaa. Your accommodation for the night is on the island of Rymättylä. You take your first ferry of the tour at Hanka after a short cycle in the morning. The harbour at Nauvo is worth some time to explore before you continue your tour, heading west along gravelled country lanes. Tackork berry farm is worth a visit, followed by the ferry to the island of Korppoo, which has a choice of restaurants. From Galtby in Korpoo, you take the ferry to the island of Kökar, which is a lovely island to discover on two wheels. This and all the islands to the west are part of the Åland region, which is part of Finland but governed autonomously and has Swedish as its official language. With its strategic location, Kökar has been visited by travellers for thousands of years. The bakery is famous for its black bread - well worth a taste! 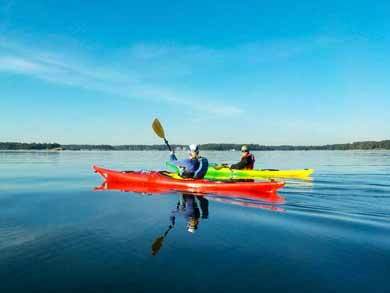 If you feel like taking to the water, kayaks are available for rent here. From the port of Harparnäs you take the ferry to Föglöges, a network of small islands connected by bridges. Degerby village there has a pub and restaurants as well as harbour and shop, and a good swimming beach just 1.5km to the south. After lunch, take the short ferry trip from Degerby to the island of Åland.ort. You bike 30km through an attractive rural/agricultural landscape to Mariehamn (the roads here are red because the tarmac contains local granite rock). Mariehamn is bustling with life in summer with good cafes and attractive harbours, and lovely areas of wooden houses to explore. To the north of the town lies a craft brewery, Stallhagen, which offers a restaurant and the opportunity for local beer tasting. Overnight in the Mariehamn area. Ferry to Kumlinge from Hummelvik. Stop at Smakby for its craft shops, restuarant and distillery and the nearby medieval castle of Kastelholm. The ruins of an old Russian military fort from the Crimean War, Bomarsund, are also nearby. Kumlinge is a very attractive island with quiet biking roads and ideal as a spot to wind down and enjoy the natural surroundings. Overnight here. From the north of Kumlinge island, take the ferry to Brändö - this area has 1200 islands, the largest of which are now connected by bridges and make for a stunning bikeing route. The main island has a shop and some other facilities, with Cafe Trixies offering lunch and snacks and Restaurant Gullvivan 2.5km to the north. Overnight here. From the north of the Brändö island road, take the ferry to Kustavi. You are now closer to the mainland - the islands are larger and you will notice the change in the natural landscapes, with more vegetation that the sparser islands further out. There are beautiful farms here and also a wider range of shops and services, including the handicraft village. Overnight in this area. From Hakkenpää take the ferrry to Teersalo and stop at Taivassalo Museum, a mansion from 18th century, to discover the maritime history of the area. The Sahan Saluuna bar offers a good place to stop for drinks while waiting for the ferry. Bike on the larger islands of Merimasku and Luonnonmaa, which Restaurant Rantamakasiini a good lunch spot. After many days in the archipelago, you may wish to continue straight to Turku, or stop to enjoy Naantali for a while. If time permits in Turku before your train, bike to the Aura river to enjoy the scene here, with a choice of restaurants and which in good weather bustles with life on the water. Take the evening train back to Helsinki and the e-bike centre for the end of the trip. Turku Archipelago (5 days/4 nights): Start at 09.00 any day by arrangement between 7th June and 24th August (latest start date 24th August). 18th June-12th August: Start at 09.00 any day by arrangement. 1st June-17th June and 13th-August-25th August: Start any day at 09.00 except Saturdays (latest start date 25th August). NB: For tours from mid-August onwards, when the main Finnish summer holidays come to an end, some facilities/attractions in the archipelago region will be closed. However, the ferry services still operate during this time and the accommodation is open, so tours are possible as normal. From the second half of August onwards, it can be very quiet in the archipelago, but this "shoulder season" can be a wonderful time to explore. The weather can still be summery and the water warm at this time, and from later August onwards, the forests have beautiful autumn colours. Prices are based on accommodation in 2-person rooms. Single supplement applies for extra person in odd-numbered group (3, 5 persons, etc). Before making your booking, please ensure that you are sure both of the dates you wish to travel and the number of persons in your party. Once a booking has been made, subsequent changes (such as a change of dates or alteration to the number of persons in your party) will incur an administration charge of £77 (or €80) per booking. This charge is in addition to any cancellation charges that may be applicable as outlined in Booking Conditions. Exact accommodation used during your tour is not fixed but will depend on availability. Acccommodation is bed and breakfast standard and will typically be 2-person rooms (with twin or double beds) with shared WC/shower facilities in the corridor. Bed linen/towels and end cleaning is included. For guests in odd-numbered groups (3, 5 persons, etc), single room occupancy supplement applies. Breakfast is included at all accommodation. No other meals are included. Some accommodation locations may have facilities for self-catering, but in most cases other meals will be purchased at local restaurants, etc. Range of 50-100km between charges (range will depend on a number of factors including terrain and the level of assistance you select from the electric motor). Slightly wider-than-usual tyres (2.6 inches) to make cycling on gravel roads more comfortable. Stem is adjustable for preferred riding position (upright or low). The electric drive and battery are high quality Bosch systems. The bikes have a small control computer on the handlebars where the level of assistance (from "Eco" to "Turbo" mode) can be selected and there is also a "walk assist" setting if you need to push the bike uphill. Charger is included (note that you will need to carry the charger/cable in the panniers with the rest of your luggage). It takes around 6 hours to fully charge the battery, which can be removed and charged indoors. Pump, water bottle and lock, which are attached to the frame. Saddle provided is a stock Focus saddle. This provides a good level of general comfort for most participants, but you are of course welcome to bring your own saddle if you prefer. Standard flat pedals are installed as default. Shimano clipless pedals can be fitted on request. Helmets: Helmets are available to borrow free of charge. A variety of sizes are available. However, guests are also welcome to bring their own helmets and are encouraged to do so. All luggage is carried on the rear rack. There are three possibilities - you are welcome to choose whichever you prefer and of course depending on the duration of your tour. We recommend packing light. Panniers have the advantage of being easy to clip onto and off the rack. A bag is perhaps slightly quieter over rough terrain. NB: Any luggage not needed during your trip can be left at the e-bike centre for collection at the end of the tour. 1 x waterproof bag (20l). 2 x panniers (2 x 20l). 1 x waterproof bag (20l) + 2 x panniers (2 x 20l). GPS with pre-loaded route description. Information on points of interest to discover and places to visit during the tour. Local contact number for support/assistance during your tour if required. Train tickets Helsinki-Turku and Turku-Helsinki for specific train times in connection with the start/end of the tour. Boat tickets Turku-Nauvo (for Turku tour). Tickets for other ferries are not included and are paid locally - see "Not Included" below. Meals apart from breakfast. Lunch and dinner are purchased locally during the tour. Entrance to any attractions/additional activities (such as museums, etc) you may wish to visit or participate in during the tour. Luggage transfer (you will carry all luggage with you on the bikes). Turku Archipelago tour: tickets are required for local ferries during the tour, typical total cost around €20/person. Turku and Åland Archipelago tour: tickets are required for local ferries during the tour, typical total cost around €6/person. Participants should be able to cycle with general good level of health and fitness, enjoy the outdoors and be comfortable sitting on a bike saddle for extended periods. Minimum 2 adults required. Minimum recommend age 12 years. Minimum height 155cm. As the tour uses e-bikes, this considerably reduces the physical effort required for cycling, though as an outdoor experience where you will bring all luggage with you, elements of the tour can of course still be physically challenging. The duration of tour chosen will of course also affect the level of challenge. However, the tour is self-guided (with full information and route guidance provided). Assistance is available if needed (additional charge may apply - see under "Description"), but participants should be comfortable fixing a puncture (though these are very rarely experienced on a tour) or dealing with other minor adjustments/cycle repairs if required. This experience is suitable for groups. Please contact us to discuss your requirements. This provider has a written ecotourism policy. Fly to Helsinki. Meeting/return point for the tour is in central Helsinki. You travel by train between Helsinki Rasila station and Turku for the start/end of the tour. Train from UK to Stockholm (Sweden) for ferry to Helsinki. 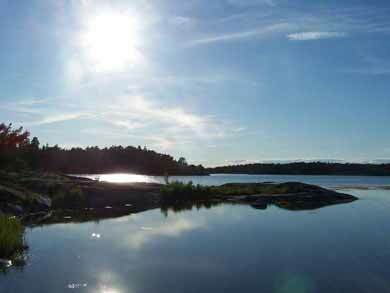 Closer to Helsinki, we also offer E-biking Helsinki's Forests, Lakes and Coast.